Are Russia's protests the beginning of the end for Vladimir Putin? Alexei Slapovsky’s 2010 novel, March on the Kremlin, opens with a young poet being accidentally killed by a policeman. Not knowing whom to blame and what to do, the poet’s mother picks up the body and, cradling her dead son in her arms, walks almost unconsciously toward the Kremlin. Her son’s friends trail close behind. Across the city, just as the mother is starting her long trek in pursuit of justice, an aging drunkard decides that his brother, who died the previous night, deserves to be interred by the Kremlin walls. So he, too, heads toward the Kremlin. At this point, a passing funeral procession joins the impromptu march, imagining that the Kremlin is now suddenly open for private burials. Alerted via social media that something is happening, the anti-system opposition enters the scene, thrilled that its dream has finally come true: Thousands of citizens are marching on the Kremlin! Failing to head off the surging multitude, the government’s Special Forces succeed only in redoubling the wrath of the crowd. Finally, the massive throng, hundreds of thousands strong, reaches Red Square. Not much unites these marchers. Most of them are not really sure why they came out onto the streets. They do not have a common platform, common dream, or common leader; yet they are held together by a conviction that “enough is enough.” The president speaks in an effort to appease the seething multitude, talking of democracy and the need for change, but no one is interested in what he has to say. At this point, there is nothing more that the government can do. The nonfiction version of these events unfolded last month in Russia. Though it was manipulated elections, not a dead poet, that sparked the crowd’s anger, the protesters had one important thing in common with the disaffected marchers in Slapovsky’s novel: They seemed to emerge out of nowhere, taking almost everyone—including perhaps themselves—by surprise. Just two months ago, few observers would have predicted such an event. Russia seemed insulated from the pro-democratic uprisings that swept the Middle East over the past year, just as it had proved immune to the revolutions that had taken place several years earlier in Ukraine, Georgia, and Kyrgyzstan. And, indeed, there are clear differences between the situation in Russia and, say, Egypt. For one thing, Vladimir Putin is much younger than Hosni Mubarak; Putin has been in power for eleven years, compared with Mubarak’s 30. Moreover, the Russian population is much older than Egypt’s; chances that the Russian army will side with the people against their rulers are vanishingly small; and there is simply no equivalent in Russia to Egypt’s Islamists—a well-organized segment of the opposition that claims a sizeable power base among the population at large. For all these reasons, prior to December a deep pessimism had long reigned among those wishing to mount a serious challenge to the Putin system. The dissatisfied were running to the airports to leave the country, not running to opposition rallies. And yet, here we are. Putin’s days in power may not be over, but the system through which he maintained his grip on the country appears to be finished. Because autopsies can be performed only on dead bodies, it is today possible to infer things about this system that were not entirely visible a few weeks ago. Only now are we able to look inside the fabled political strategy known as “managed democracy” and begin to get a sense for how it actually worked. The results of this autopsy tell us a great deal about why Putin’s regime is faltering. And they give us a sense of what might lie ahead for Russia in the months and years to come. IN ORDER TO UNRAVEL the enigma of both Putin’s rule and his newfound problems, it helps to start with one revealing aspect of Russia’s recent political history: its elections. As journalist Julia Ioffe has noted, the reality that these elections have been “engineered” is “something everyone in Russia, no matter what their rhetoric or political persuasion, knows and accepts.” Ballot stuffing, multiple voting, miscounting of votes, media monopoly, signature invalidation, and candidate disqualification are what Russian elections have been about for many years. So, if everyone knew the elections were rigged, why did Putin bother to hold them? Making sense of this is as key to understanding Putin’s regime as making sense of the show trials of the 1930s was key to understanding Joseph Stalin. An important task of Stalin’s spin doctors 75 years ago was to use the trials’ pre-decided verdicts to showcase the dictator’s power—a demonstration that was all the more effective the more painfully innocent were those who, in a choreographed mise-en-scène, falsely confessed their betrayal of the Great Leader and were speedily executed for their compliance. Similarly, though much less cruelly, fraudulent elections from 2000 to 2008 were meant to demonstrate the Putin government’s overwhelming power. The odd thing about these elections was that they did not necessarily need to be rigged. Had the elections been free and fair, Putin (or even his surrogate, Dmitri Medvedev) would presumably have won quite handily. Even when labeling Putin “the most sinister figure in contemporary Russian history,” a leading spokesman for the Russian human rights movement reluctantly admitted some years ago that “Putin would have won the campaigns of 2000 and 2004—though perhaps without such large, unseemly margins—even if they had been free of vote tampering and the illegal use of the government’s so-called ‘administrative resources’ and if the candidates had actually had equal access to the voters through television and the press.” Surveys conducted by independent pollsters corroborated this view. Why would a ruler rig an election if he did not have to? Because the rigging, not the election, was the point. The Kremlin not only manipulated these elections, it also insisted that everyone be made vividly aware of this manipulation. It seemed to want people to know that it was directing the movements of every single player in the electoral charade. Consider the case of Mikhail Prokhorov: The billionaire owner of the New Jersey Nets was recruited by the Kremlin last spring to be the new leader of a housebroken opposition party, Right Cause—and then, in the fall, was ejected from the post in a highly public way that left little doubt the Kremlin was pulling the strings. For Putin, in other words, openly manipulating elections has been an extremely effective way of asserting, or rather exaggerating, his strength. Rigged elections, known to be rigged, are probably the cheapest and easiest way for a regime to mimic the authoritarian power that it does not actually possess and thereby to bolster its grip on the country. It takes only modest administrative capacity to rig an election; but a rigged election produces a disproportionate increase in the government’s reputation for power and control. Organizing a pseudo-election is like wearing sheep’s clothing to prove you are a wolf. This brazen, even proud, electoral fraud was central to concealing the Putin regime’s deepest secret, which is only now becoming clear in retrospect: Rather than being misgoverned, Russia is barely governed at all. Contrary to the predominant view, Putin’s real power has never extended much beyond Moscow. Russia’s strongman was strong enough to prevent anyone from aspiring to replace him; but he spectacularly failed in his attempts to modernize his country. Putin is not the boss of Russia. It is more realistic to see him as a hostage to regional and other elites. He did not succeed in overcoming the weakness of the state. He succeeded only in hiding it to a significant extent. His vaunted vertical of power is a sham, boiling down to a grant of impunity to regime loyalists and an opportunity for some of them to ascend into a charmed circle of unimaginable riches—to steal the natural wealth of the nation with only minimal resort to violence. Putin, in short, has never exercised much control over the country, but he succeeded in creating a system that was relatively stable because it made him appear much stronger than he actually was. IF THIS ANALYSIS of the past decade is correct, then it would suggest that Putin is in a great deal of trouble going forward—more than is commonly realized. The recent protests have shattered his carefully constructed reputation for being in control of events, which is the principal source of his popularity and legitimacy in a society where public support flows toward those who manage to persuade citizens of their unflinching grip on power. Large Moscow protests have destabilized the regime not because they drew attention to its unfairness and corruption—which was long ago universally understood by Russians—but because they demonstrated its weakness, hitherto largely hidden by the Kremlin’s showmanship from public view. Bombing is probably the best way to destroy a village; but, to destroy a Potemkin village, all that is required is to change the camera angle to reveal the improvised props holding up the flimsy façade. Last month’s post-election demonstrations were an expression of this subtle shift in perspective. 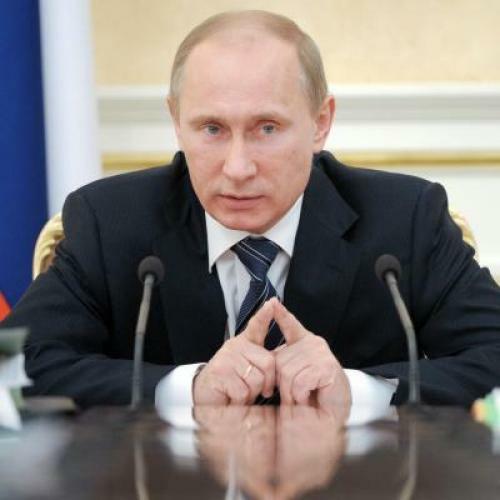 So what survival strategy will Putin adopt ahead of the March presidential elections? One thing is clear: Taking the same approach as in the past is probably not an option. Given the certainty that, on March 4, volunteer election monitors will document and immediately post online damning evidence of electoral fraud, there is no chance that Moscow’s streets and squares will remain quiescent in the face of an artificially inflated pro-Putin vote. The inevitability of post-electoral protest explains why, from the regime’s perspective, rigged elections have outlived their usefulness. Rather than conveying the power of the regime, they will provide only an unwelcome occasion for displaying the constraints under which the government now finds itself forced to operate. Instead, Putin has two other options. He can choose to allow a genuinely competitive race, with the hope of gaining popular legitimacy by risking defeat at the polls—the step that Mikhail Gorbachev fatally refused to take many years ago. Or he can retreat behind the protection of the state security services, allowing the regime to drift into a more blatant authoritarianism. This last option is very unlikely to succeed. A crackdown on the protesters, even if it were feasible, would carry enormous risks. True, Boris Yeltsin shelled the parliament in 1993; but Russian society was then ideologically divided and the most radical democrats supported Yeltsin in his decision to shoot. The West was also behind Yeltsin. Today, Putin can reasonably fear that shooting at crowds of demonstrators might land him in the company of Muammar Qaddafi. History shows that only politicians with a strong social support base—rooted in ideology, religion, or kinship—dare shoot at protesters. But the other option—allowing a genuinely competitive rather than a fixed vote—is also far from guaranteed to succeed. In previous elections, Putin has been able to offer a compelling narrative to voters. In the run-up to the 2000 election, Putin, then completely unknown, used the Chechen crisis to convince Russians that he could save them from chaos and war. In 2004, he managed to make Russians believe that the choice they faced was between him and the oligarchs. The country’s most prominent and independent-minded oligarch, Mikhail Khodorkovsky, was thrown in jail, and the majority of Russians preferred to believe that their president had finally snapped the chain linking him to Yeltsin’s self-enriching circle. In 2008, contrary to popular expectations, Putin decided not to run for a third term, thus implicitly promising substantial changes in the existing framework of power. In all three cases, in other words, presidential elections were framed by a dramatic public narrative that voters could easily understand. Putin is evidently banking on the opposition’s lack of coherence and common leadership. Before he was transferred to a new position in late December, Vladislav Surkov was, in his role as the Kremlin’s chief political strategist, busily publishing secretly recorded phone conversations in which an opposition leader trashed his colleagues. But, while the opposition is indeed split—it consists of communists, nationalists, and liberals—one of its leaders, Alexei Navalny, has popularized an ingenious strategy that may dramatically change the equation. Responding to the regime’s basic message that there is no alternative to Putin, Navalny has been insisting that any alternative is better than Putin. His strategy for the December parliamentary elections—opposed by veteran opposition leaders Boris Nemtsov and Garry Kasparov—was to urge people to vote for any party other than the ruling one. By uniting the different strands of the opposition, this approach could conceivably have profoundly damaging consequences for Putin in the upcoming presidential race—especially if he is forced into a run-off. PUTIN IS now facing a dilemma similar to the one Gorbachev faced in the last two years of the Soviet Union. Genuinely competitive elections, assuming he would win them, might possibly rescue his collapsing legitimacy. But winning a real election nationally, while doing poorly in Moscow and St. Petersburg, would not be the end of his troubles. Afterward, he would start being held publicly responsible for his actions. The media would feel encouraged to report on his business associates and the opposition would be constantly after him, pointing out all the promises he fails to keep. And, even if he somehow clings to power, the feedback loop between his aura of strength and his popularity will have been broken forever. Gleb Pavlovsky, a Russian political scientist and former adviser to the Kremlin, likes to tell a story about an ordinary voter he interviewed during the run-up to the 1996 election. The voter reported that she supported Gennady Zyuganov, the Communist Party candidate, but was going to vote for Yeltsin. When he asked her why she wasn’t going to vote for Zyuganov, she replied, “When Zyuganov is president, I will vote for him.” It turns out that people often support, or at least accept, a heavy-handed ruler simply because he is in charge. But, once his stature has been diminished, there is frequently no going back to the way things used to be. Stephen Holmes is a professor of law at New York University. Ivan Krastev is a chairman of the Centre for Liberal Strategies in Sofia and permanent fellow at the Institute for Human Sciences in Vienna. This article appeared in the February 2, 2012 issue of the magazine.